Every weekday since last Monday, April 15, and until May 3, Justin is attending his summer class from 10:00am to 12:00noon. 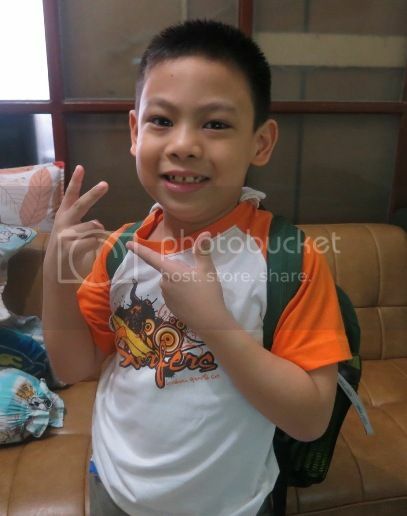 We enrolled him in the Advanced Math Workshop, one of the summer enrichment programs of LSGH’s Grade School Department. We paid Php3,000 for this summer class that will last for 15 days. He actually wanted to be in the English Communication Skills Workshop class, but his Dad said he’s already good at it. Aside from enhancing his Math skills, we really wanted our son to be preoccupied with something else other than his Dad’s iPad and laptop. Playing iPad games and laptop games is all that he’s doing since school ended last March 12. I’m sure most of his classmates are doing the same, but we wanted him to do other things, learn something new and be more productive. Are your kids busy with summer class, too? This entry was posted in Advanced Math Workshop, Summer Class, Summer Enrichment Program. Bookmark the permalink. 2 Responses to Off to Summer Class! My daughter is having her summer class too. More on Reading Comprehension and Math. Last week, she had her McDonald’s Kiddie Crew Workshop. Rap is also attending their LSM’s compulsory summer class for his batch from April 10 – May 3. The school’s implementing the calibration to K-12 so from Grade 6, their batch will study Grade 7 & 8 lessons from this summer until the next summer class. Makakatipid kami ng 1 year in terms of time for the K-12 program. ← I Want These Kipling Bags!